The authors are with ISRO Satellite Centre, Thin Film Laboratories, Airport Road, Bangalore 560017, India. 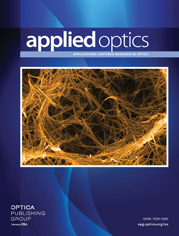 A generalized theoretical formulation for multilayer antireflection coatings (ARCs) has been established, which has scope for considering both zero and nonzero reflectance at one or more than one wavelength. Starting with this, a new design method for three-layer ARCs making use of input reflectance parameters at two wavelengths (R1 and R2 at λ1 and λ2) has been developed. It allows for determination of all the unknown design parameters explicitly without any a priori conditions on them. The scope of the method has been extended by incorporating optimization of the resultant solutions through an optimizing parameter, integrated reflection loss R* to obtain efficient designs with respect to spectral bandwidth, residual reflection loss, etc. The resulting hybrid methodology is found to be generalized in that it can be used to design a wide range of ARC systems, broad band to V-type, irrespective of the nature of the substrate (absorbing or nonabsorbing) and spectral region of use, with adaptability to simpler/complex ARC systems and other thin film systems such as dichroics/beam splitters and achromatic reflectors. (1) Graphical/Argand diagram method (Vasicek, Turner, Muchmore) Vector diagram analysis of reflection coefficients For known integral thickness ratios, refractive indices are evaluated or for known refractive indices, thicknesses subjected to integral ratio conditions are evaluated. Constraints on both refractive indices and thicknesses. Method of evaluation is cumbersome and less efficient. Approximate reflection coefficient relations are used. (4) Method of effective interfaces (Thetford, Baer) Application of Fabry-Perot etalon theory to ARCs Evaluation of thicknesses for given refractive-index configuration Baer’s method offers analytical equations for evaluation of thicknesses Thetford’s scheme is approximate and a trial and error approach. In Baer’s method, designs with zero base reflection can only be possible. Existence of dual set of solutions. Refractive-index limitations. Only two out of three thicknesses can be evaluated. (9) Refractive-index optimization method (Furman, Stolina) Lagrange’s method of optimization applied to ARCs For known thickness values, refractive indices are optimized. Involves complex optimization routine. Often optimized values should be rounded off to the nearest material values. Thicknesses are fixed a priori. (10) Method of least squares (Heavens, Liddel, Appa Rao) Optimization of design variables using least-squares merit function Optimization of thicknesses for given refractive indices Scope for generating efficient designs Mathematical analysis is complex. Needs extensive computation and a good starting design.